Metalworking fluids (MWFs) can cause adverse health effects through skin contact with contaminated materials, spray or mist and through inhalation from breathing MWF mist or aerosol. While MWFs are safely handled by thousands of workers, problems can develop when good hygiene practices are not followed or when fluids are not properly managed or maintained. Major health concerns of improperly managed fluids or when good hygiene practices are not followed include skin irritation, allergic contact dermatitis, irritation of the eyes, nose and throat, and occasionally breathing difficulties such as bronchitis and asthma. 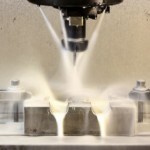 Machine tooling processes such as wet grinding, cutting, turning, milling can introduce a number of contaminants into the workplace environment, including oil and water-based coolant mists and smoke. Air Purification Inc. can help you collect oil and water-based coolant mists and smoke with a range of mist collection units that provide energy efficiency, low maintenance and improved worker safety.